A trained chef, he was co-owner of Percival's Catering firm in Bolton and Director and co-founder of Smithills Coaching House with his triplet brother Alan Ellis Clarke, Mayor of Bolton 1972-73. He retired in 1991 after 39 years in catering. Spent his National Service in the Catering Corps. Son of Alderman Ellis Clarke. Represented Central and West Wards between 1964 and 1983. 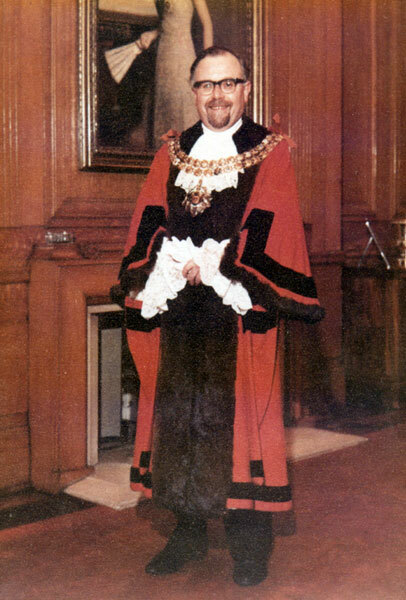 He was Mayor during Jubilee Year and took part in various Royal occasions including the visit of Prince Charles to Bolton. He inaugurated the Mayor's Medal for Voluntary Service. He retired from the Council in 1983. He was a Trustee of the Octagon Theatre. He was a Governor of Bolton Technical College and a member of its Catering Advisory Board for many years. Founder Chairman of Bolton and Wigan Hotel and Catering Training Board and later Founder Chairman of the Central Lancashire Hotel and Catering Board. He was called the Children's Mayor by a fellow Councillor and the press "because he was very popular with the young. He had the gift of being able to communicate well with children". His sisters, Mrs Barbara Doxsey, Mrs Pat Harthern and Mrs Adrienne Bolton shared the duties of Mayoress for four months each. 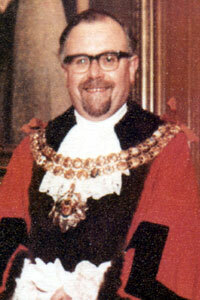 Formal portrait of Donald Stewart Clarke as Mayor of Bolton.